If you are trading breakouts then look for these 4 confirming signals. Trading breakouts is risky. You’re entering at an extreme price and the market can easily and quickly move against you. But if you get it right, you can be jumping on board a breakout into trend – the market moves quickly and the profits come easily. Today’s video was prompted by a great email from Trey, talking about how Amateurs love trading breakouts – and are often wrong. It happened to arrive on a day when I took a breakout trade at the open that turned into a nice OSOK (one shot, one kill) for 4 points. So why did this breakout trade work? And what signs should you look for? The strongest upside breaks will happen when you have resistance levels on the 500 and 1500 tick charts close together and being broken almost simultaneously. 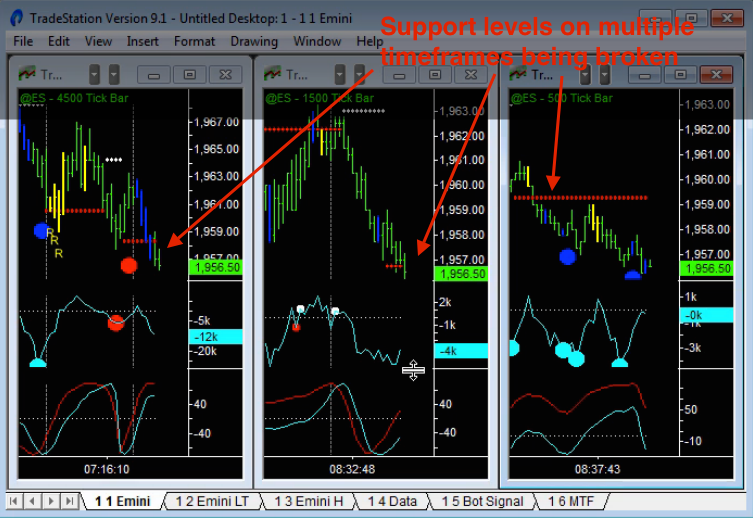 In the video example above, the resistance levels were only 1 point apart. Today’s upside breakout had cyclical support on the daily chart supporting it. Yesterday, there was an upside breakout at the open that failed – and on that day we had a downside bias. Daily bias can be tricky to figure out and is only ever a guess – so don’t let it stop you taking a trade if #1 and #2 are in place. And finally, watch out for RAMBO (potential “Reversal of an AMateur BreakOut”) patterns, particularly when they come with exhaustion volume. They show the breakout is being led by the Amateurs (low average trade size) and is suspect. At the very least the breakout will lose energy after a RAMBO pattern. And if the pattern happens in the “shadow” of a previous high/low they’re great places to fade (go in the opposite direction of the short term trend) the breakout. I hope you found this video and article helpful on trading breakouts.